Senate Bill 313 makes it easier for domestic violence victims to remove the name of an abuser from a shared telephone plan. Senate Bill 919 which allows domestic violence victims who live in public housing to be relocated to another unit. 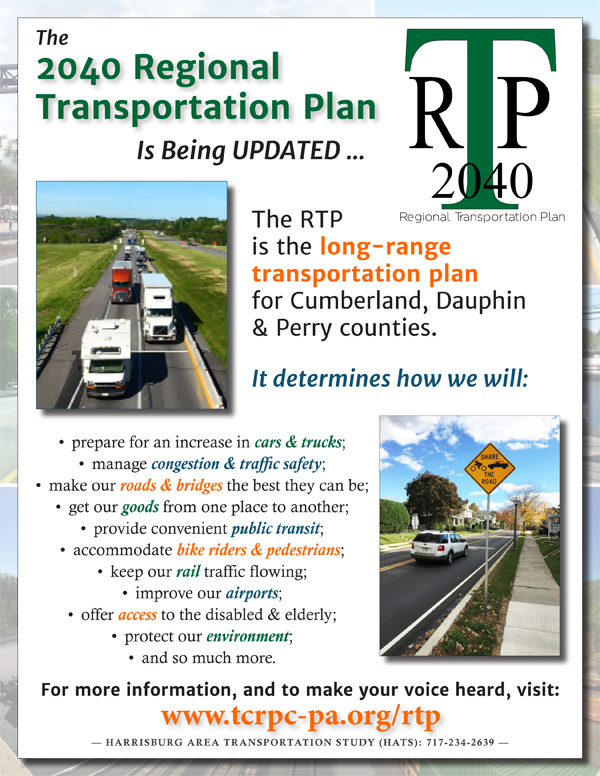 The long-term Regional Transportation Plan for Dauphin, Perry and Cumberland counties is being updated, and your input is wanted. The purpose of the plan is to document the current status of transportation projects and programs, identify long-term needs, and recommend projects to minimize traffic congestion and maintain safety. The project is being overseen by the Harrisburg Area Transportation Study. A draft of the plan is expected to be available online for review and comment sometime this spring. In order to share information and have a dialogue with my constituents interested in specific topics, I have established several citizen advisory committees: Agriculture, Small Business, Sportsmen/women, and Veterans. The next meetings are scheduled for the evening of Thursday, April 12 in Duncannon. For more details, sign up on my website or call 717-787-6801. 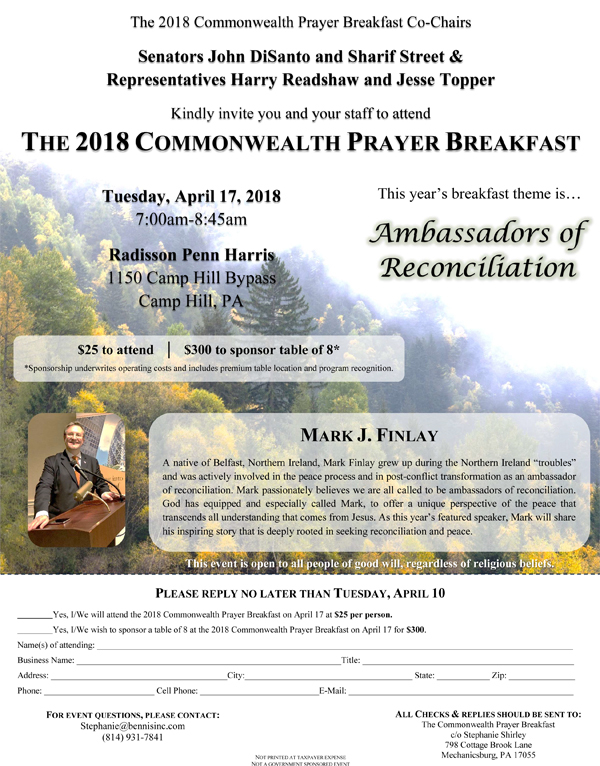 I’m honored to be one of the co-chairs of the 2018 Commonwealth Prayer Breakfast, scheduled for April 17 at the Radisson Penn Harris in Camp Hill. This year’s theme is “Ambassadors of Reconciliation.” Click on the invitation above for more information. PPL Electric Utilities wants to help you save money. The company offers a wide range of energy efficiency programs – like appliance recycling, discounted LED bulbs at participating retailers, and rebates on energy-efficient HVAC equipment. Visit savewithppl.com for more information on PPL Electric Utilities’ programs for homes and businesses, as well as energy-saving tips. Consider upcoming performances and events at Gamut Theatre. Jump Street receives state arts funding support through a grant from the Pennsylvania Council on the Arts and runs a number of local art programs. Their 17th Annual Derby Day is Saturday, May 5th, 2018. Senate Bill 792 repeals and replaces the Fertilizer Act. I voted against this bill because it imposes excessive new regulatory requirements over commercial and residential fertilizer applications and will likely lead to higher costs for consumers. Senate Bill 501 requires a domestic violence defendant who is ordered by the court to relinquish firearms to surrender the weapons to law enforcement or a third-party dealer. (Sponsored by Sen. Tom Killion, R-9).